While it’s fun watching deer, observing them up close in your garden or dealing with the consequences of one of their visits is a whole different story. 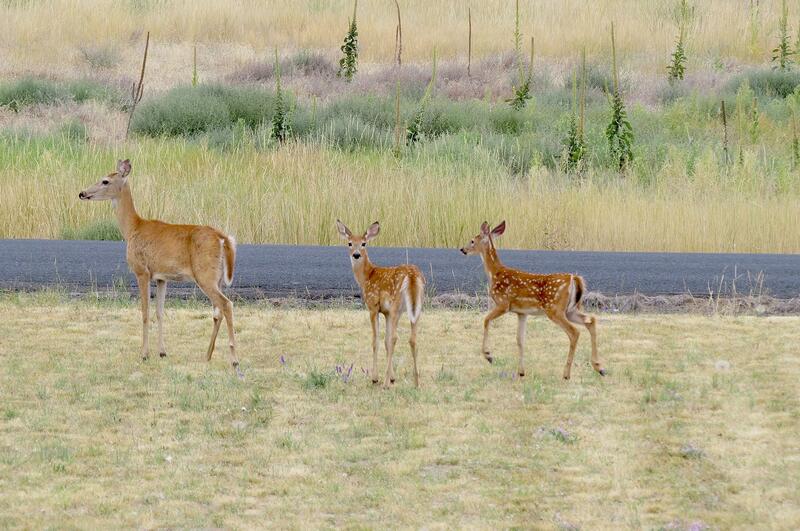 In the Inland Northwest, many gardeners deal with deer on a regular basis and find it very frustrating. We’ve experienced deer problems for many years and have found that the very best solution to keeping them out of our garden was putting up a deer fence. Ours is a combination of 4-foot-tall field fence to which 3-and-a-half feet of heavy duty plastic deer fencing was attached. But there are other things you can do to repel or scare them away from an area. Deer have a keen sense of smell. You can take advantage of that by hanging bars of deodorant soap in areas of your landscape they frequent. Another option is to mix a dozen eggs in a blender and add them to a gallon of water in a clean sprayer. Because deer don’t like the sulfur smell given off by the eggs, you can spray their favorite plants to keep them away. It must be reapplied after a rainstorm. Many deer repellents are available at garden centers and online. It’s important to read and follow the label directions for the best results. If you need to use a repellent on edible crops, make sure the label indicates it’s safe to do so and how long to wait before harvesting them. To scare deer out of your yard, there are motion-activated sprinklers that shoot a jet of water to startle them. Just make sure you remember that it’s set before wandering within range and getting drenched. Having a dog or two in your backyard is another way to scare the deer. They don’t like being barked at or chased and will remember to avoid your yard. Deer are creatures of habit. They expect obstacles to be in the same place every time. If you move things around a bit, it can throw them off. In addition to fences, there are other types of barriers to keep deer from munching your favorite plants. Consider surrounding the trunk and lower portion of a tree’s canopy with a wire cylinder to prevent nibbling or antler-rubbing on the trunk’s bark in the fall. Deer don’t like to walk on unstable surfaces. If they make a beeline for certain plants, place a sheet of welded-wire fencing on the ground in their pathway. The biggest challenge of dealing with deer is that not all of them have read the books on which plants they’re not supposed to like or what they should be repelled by. If they are stressed enough by hot, dry weather, they will be bold and take advantage of opportunities to come into your yard and dine on your plants. When we first started landscaping our property, we naively selected plants that deer think are delicious. Our biggest goof was putting up a hedge of arborvitaes. We also quickly discovered that tulips, hostas and tree fruits are irresistible to them. While there are no guarantees that a plant is deer-resistant, you might consider planting foxglove, bee balm, black-eyed Susan, columbine, coral bells, cotoneaster, cranesbill, lavender, lupine, peony, red-twig dogwood, lilac and juniper. When it comes to dealing with deer, try to be flexible, observe what works and keep a good sense of humor. To learn more about keeping deer out of the garden, watch this week’s “Everyone Can Grow A Garden” video on my YouTube channel, youtube.com/c/susansinthegarden.